Are you looking for the best treadmill in India for home purpose or gym?. Buying a treadmill is a great option for walking or running exercise. You know this proverb. “Health is Wealth” nothing too important than. Nowadays our hectic schedule people do not much serious about a health issue and they don’t spend a time for outdoor exercise. A treadmill is the best way to glowing your health and improve your fitness strategy without going to the gym and waiting in their lines. Also, not need to walking outside at night in the dark. For this reason, buying a treadmill at home is a best alternative option to keep themselves healthy. But you know this is difficult to search for the best treadmill in India for home use. Our below-given list will help you find the best treadmill in India and best treadmill brand in India. 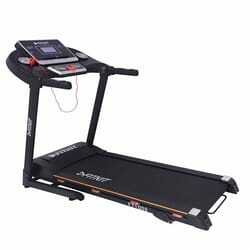 Lifeline 4 in 1 is one of the best treadmill in India. This treadmill suit for a mild workout on home use. The fordable and non-motorized treadmill machine has easily store in the house. The treadmill is equipped with a beautiful console display shows the speed, distance, calories, time, heart rate and pulse sensor. Its sturdy and swivel wheels for a better moving without generating any issue. The size of the running platform is 83cm X 140 cm and 35 kg weight. Also, you can get a wide and longe jogging surface. This treadmill comes with another 3 feature such as Stepper, Twister and Pushup Bars. It means 3 extra benefits in one machine. The product has to be assembled using an installation manual provided in the package kit. Reduce weight and belly without a gym. Do not need to walk outside at night in the dark. Maximum support 110 kg weight on the running platform. The Powermax TDM – 98 treadmill is the second best treadmill in India. On the top up 5.5 inches led display to notice your speed, time, distance, calories burned and heart rate result. The treadmill is powered by a 99% copper core powerful 1.5 HP DC motor. It has 12 different preloaded programs which can help you to burn calories based on 3 target mode. The treadmill has a 1.0 to 10 km/h wide speed range and maximum user weight capacity is of 90 kg. Its fordable space saving the compact design ideal to fit for any around your room area or inside your closet. Built-in auto-stop function that helps to stop when if you fall or drift back dangerously on the treadmill and reduces the hazardous injury. Extremely good product in this range. Weight capacity is up to 90 kg. 90 degree foldable with a manual lock. Fitkit Motorized treadmill is the third best treadmill in India on our list. It 50-inch height is ideal is ideal for both unisex. The treadmill has a 1240*420mm running surface which helps you to run efficiently. It has 12 set of pre-defined workouts programs for an efficient workout. Also, it measures a speed/distance/calories burned/time and pulse rate as well. Mostly, offers a one large LCD display for the perfect reading case. On top of the Fitfit machine, both the side provides a bottle holder so you can take the water botter and energy drink bottle at a time. 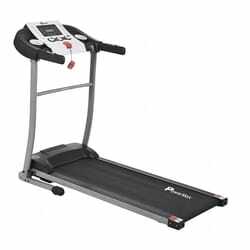 An important feature of this treadmill is used a 1.75HP motor which is quite powerful. 90 degree folding for more space saving. Maximum user weight capacity is 110 kg. 3-year frame and 1-year motor & 1-year parts warranty. Powermax Fitness is a fifth best treadmill in India on our list. The unique ability and user-friendly treadmill offer an extra wide 5.5″ LCD display for a better watching experience every time. It has an Electronic sensor shows the time, distance, calories, speed and pulse rate. Mobile & tablet holder feature is equipped with it for keeping your smart devices safe while running. Powermax Fitness TDM-100S has a soft-drop folding system, dual jumping wheels, energy saving motor, waterproof, independent CPU and ply-polyester running belt for dynamic balancing. The 1.8mm thick multi-ply polyester belt helps to reduce shock and slip on the surface. Its maximum capacity is 110 kg but that recommend extra 25Kg buffer for running means that 85 Kg or less ideal for running. Running area is 44”x 15.7”. Noise is controlled within 68DB. Heart rate sensor on the handrail. Is the last but not the list, Is the fifth best treadmill in India on our list. 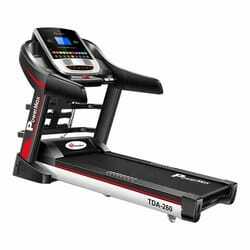 The Powermax Fitness TDA 260 mentioned above with a few differences. It powered by a 2.0HP DC motor and capacity to maximum user weight of 120 kg. The 7″ full-colour touchscreen display perfectly visible your exercise time, speed, distance, calories, heart rate, Fat + BMI (Body Mass Index) analysis. Mostly, high-grade folding & unfolding system thanks to its hydraulic soft drop system. It energy saving motor consumes less than 1-unit per hour. However, it does have a 50.3” x 17.7” running deck which gives you capacious running environment. It’s capable to carry a maximum 120 kg of user weight. Furthermore, the comes with an amazing lifetime frame warranty, 3-year motor warranty and 1-year parts & labour warranty. It comes in 90% assembled. 3 layers of quality paint prevent corrosion. Different 15-Level auto incline for the intense workout. Which treadmill to buy for home? 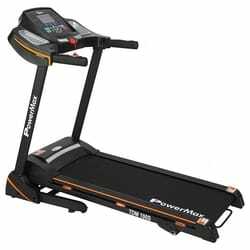 The Powermax Fitness TDA 260 is the best treadmill for home use and best in term of performance. Can I lose belly fat by running on a treadmill? Yes, if you can regular exercise on a treadmill that activity burns your calories in the overall body and reduce your weight effectively. Which kind of exercise burns the fat most? Walking, jogging, cycling, swimming and jumping rope is the best exercise to burn your calories fast. Can I buy the treadmill online? 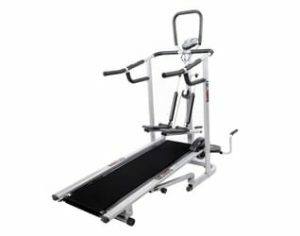 Yes, you can buy a treadmill online from reputed online retailers with getting a benefit from the discount. 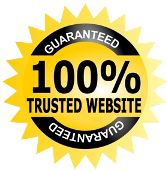 Nowadays Amazon is a world’s largest popular online retailer.